Readers first met Emma of Normandy in Patricia Bracewell s gripping debut novel, "Shadow on the Crown." Unwillingly thrust into marriage to England s King AEthelred, Emma has given the king a son and heir, but theirs has never been a happy marriage. In "The Price of Blood," Bracewell returns to 1006 when a beleaguered AEthelred, still haunted by his brother s ghost, governs with an iron fist and a royal policy that embraces murder. As tensions escalate and enmities solidify, Emma forges alliances to protect her young son from ambitious men even from the man she loves. In the north there is treachery brewing, and when Viking armies ravage England, loyalties are shattered and no one is safe from the sword. Rich with intrigue, compelling personalities, and fascinating detail about a little-known period in history, "The Price of Blood "will captivate fans of both historical fiction and fantasy novels such as George R. R. Martin s Game of Thrones series." Praise for "The Price of Blood"
"The female characters in particular are as flesh and blood ... and they are a joy to read. Highly recommended" - "Historical Novel Review"
"Historical fiction fans looking for a new noble heroine will embrace this excellent saga." 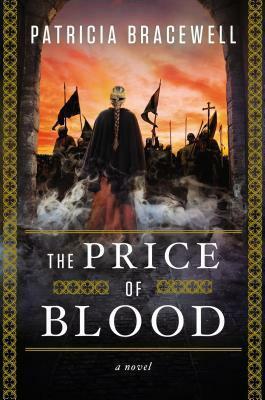 --"Library Journal"
"In a splendid fusion of historical research and imagination, Patricia Bracewell's "The Price of Blood" thrusts us back a thousand years to the era of Emma of Normandy. As Bracewell writes into the gaps of history, the sense of visceral tension never flags as she culls rare drama from the rivalries of court and record of brutal acts, while never failing to illuminate the private fears, affections, and struggles of her characters. An extraordinary saga." --Adrienne McDonnell, author of "The Doctor and the Diva"
"With skill and breathtaking research, Patricia Bracewell has given vibrant life to a fascinating but forgotten queen and to her role in a harsh, obscure time in the Middle Ages." --Anne Easter Smith, author of "A Rose for the Crown" and "Queen By Right "
"The stakes are unbearably high in the meticulously researched, fast-paced "The Price of Blood," with Queen Emma of Normandy struggling to survive in a royal court hurtling toward disaster. Torn between duty to her disdainful husband and a forbidden love, Emma fascinates: intelligent, proud and bold--and fiercely protective of those she cares for. This is a queen like no other." --Nancy Bilyeau, author of "The Crown"
"A deep and stirring novel, elegant in detail and convincing in execution." --Cecelia Holland, author""""of" The Secret Eleanor "
"In The Price of Blood, Patricia Bracewell proves once more that she is an alchemist. She turns the leaden chronicle accounts of Emma and Aethelred's embattled kingdom into a narrative thrumming with life, the historical figures heartbreakingly human. The epic battles of the Anglo-Saxon are rendered personal, tragic. The fated characters disturbed my sleep and haunted my walks. You have been warned." --Emma Campion, author of "The King's Mistress"
"With vivid prose and impeccable research, Patricia Bracewell draws the reader into the treacherous intrigues of a kingdom on the brink of destruction. Her heroine, Emma of Normandy, faces deepening danger. Blinded by mistrust of his elder sons and his queen, Emma's husband, King Aethelred leaves England vulnerable to the rising tide of Viking raiders Against the backdrop of this bloody conflict, courageous, resourceful Queen Emma must find a way to stand against the Viking raiders, her own husband and the conniving woman who will use any weapon-- poison, sorcery, or her body-- to steal Emma's crown As Emma fights to save her kingdom, and the crown that is her son's birthright, we share her unforgettable journey-- a woman who seizes her own power from the wreckage of a loveless marriage." --Ella March Chase, author of "The Queen's Dwarf"
"Ms. Bracewell is a rising star in historical fiction. Her nuanced, heartrending portrait of Emma of Normandy and her Viking-ravaged world brims with intrigue, courage, and sacrifice; vividly written, THE PRICE OF BLOOD offers readers something different: a rarely explored era of dark superstitions, where one woman must seize power the only way she can." --C.W. Gortner, author of "The Queen's Vow" "From the Trade Paperback edition."